PACK TRIPS..... Sorry, but the Backcountry Camps are currently closed. Discover one of the most beautiful valleys in Sonoma County. Only horses and hikers have access to these peaceful clear headwaters of Austin Creek. Dancing over bedrock, the stream we camp beside is a protected spawning ground for steelhead trout. Wildlife abounds. River otter play in our swimming hole. The mountainous terrain provides exciting vistas and an interesting variety of habitats to explore. 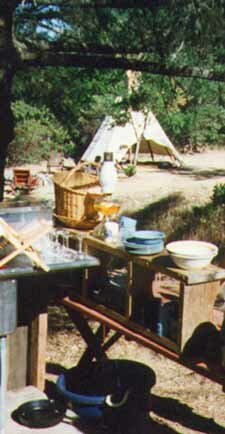 Our base camp has picnic tables and outhouse. Bring sleeping gear. 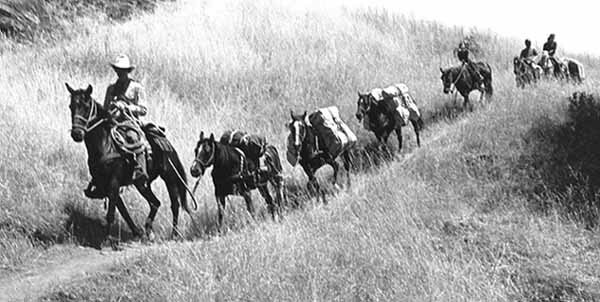 A string of pack horses haul everything else to make a comfortable wilderness camp. Available May to early October. This trip allows time to be lazy, relax in streamside hammocks, swim, and explore the backcountry on an optional lunch ride. By keeping trips small, guests are pampered with excellent service and great food. Fresh country cuisine is prepared to individual requests. As owners, a personal relationship with guests is our special pleasure, for some of our best friendships have been formed on these trips. Leave today's pressures behind. Relax and enjoy a pace no faster than your horse's gait. Create a time for personal growth and reflection, or true companionship. Here families come together without distraction, sharing a lifelong memory. Learn the ways of the wild or improve riding skills and horsemanship. Let us spoil you with delicious meals and a holiday free from chores, or pitch in helping care for horses and camp. There's something special for everyone on a backcountry pack trip. DUNNAGE OR SPOT TRIPS: For hikers or riders who wish only their gear packed to a pre-arranged backcountry campsite, and/or packed out. 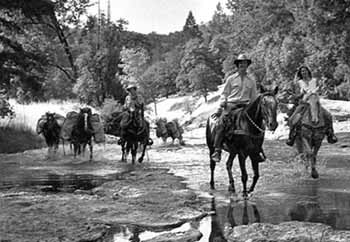 Pack horses must stay on wider fire roads and pack string does not take rest or lunch stops. Hire a guide if you wish a more leisurely horseback pace on interesting trails. Gear must be pre-packed and weighed in acceptable containers or duffle bags, and arrive at the Pack Station by 9am. State Park charges $16 per day for backcountry campsites, 10 day limit. $300. Pack Horse (150 lb.weight limit, two pack horses minimum); or Riding Horse (180 lb. weight limit). $400. Packer, guide, or cook... and horse.